Designs by Lisa Somerville: Daisies Anyone? Fresh Flowers are nice, but these Daisies are even better, they won't die, and you can create your own custom color Daisies - the perfect gift for Valentine's Day, Mother's Day, or just because! The other day I posted my Basket of Blooms using the Flowers #2 Die, and mentioned I would remake the project as soon as my new goodies arrived, as I wanted to use the new Texturz Plates and Flower Daisies #2 Die. You can find both of these items on my website - once there just use the Search Box and type in Texturz Plates to see what these new projects look like, then hit your back arrow and type in Daisies #2 to view the Daisy Die. 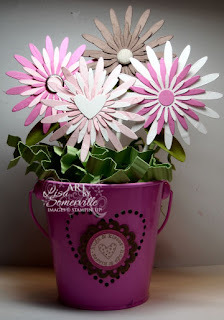 For this first one, I used a Tin Pail I found at the Target Dollar Spot, ran my card stock through the Texturz Plate, then cut with my Daisies #2 Die, and added color with my sponge daubers and ink. You can see from my finished project, I also added a few different elements to the centers, I used a Build-a-Brad, Corduroy Button, and a punched out Heart from Heart to Heart Punch to add some variety to my flowers. 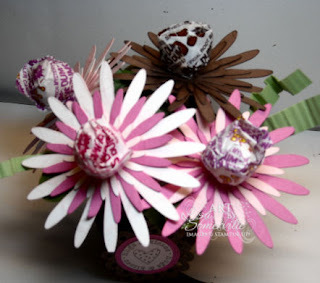 When stacking my flower pieces, I simply adhered them to a 1-3/8" circle, then adhered that circle to a Peppermint Patty, pushed in my Wilton Sucker Stick, added the Faux Leave created using the Texturz Plate and Oval Punch, then pushed into the styrofoam piece I had inserted in my tin. To create the grass, simply crimp your card stock, cut in 1/2" strips then scrunch, instant confetti pieces, a great way to use up your scraps. The tag on the front of the pail was created using the Love You Much Stamp Set. This second Basket of Daisies is almost exactly the same as my Basket of Blooms - except I changed my Texturz Dies and Bigz Flower Die. I also added the stamps from the Love You Much Bundle. 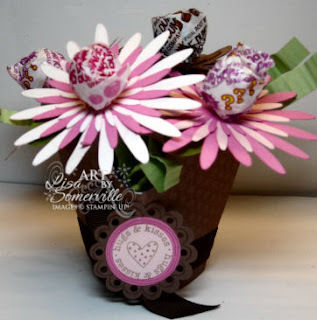 The basket is made with the Die Cut Blooms Basket Die. Don't forget you have until January 31st, to order the Love You Much Bundle at a discounted priced. Email me today to place your order, or shop 24/7 via my website. Lisa these are wonderful! Such a cute idea. Wow!! Lisa these are awesome!! !